To buy or not to buy? That's the question, as Windows 7 finally makes its debut. 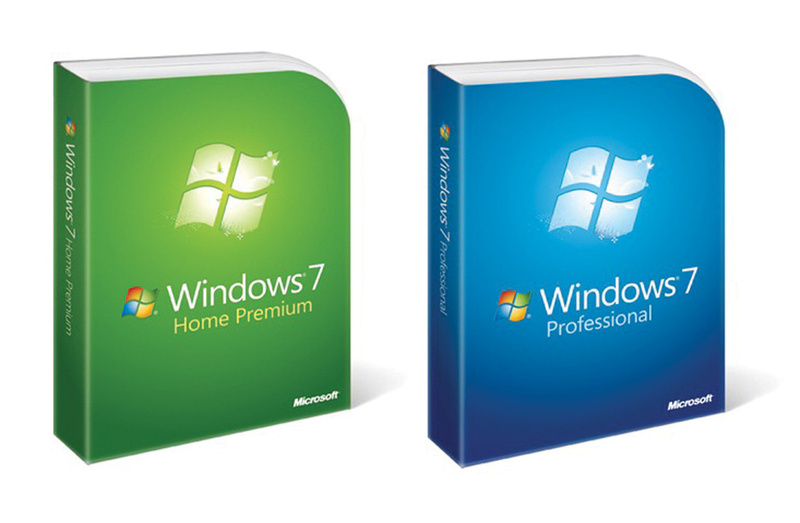 Musicians considering upgrading to Windows 7 should choose one of these these two versions. Windows 7 was released on October 22nd. The question now is: should you buy it? And if so, which version should you get? Well, it all depends on how happy you are with your current version of Windows. If it's still doing its job of running your existing audio applications well, you're not forced to change your operating system. Remember, an OS change can involve a lot of work, especially since, for best results, it requires a clean install on a freshly formatted partition, followed by the reinstallation of all your applications, along with re‑authorisation of challenge/response protected software. This could take several days for some SOS readers! The majority of musicians are still running Windows XP with Service Pack 2 or 3, with a smaller proportion on Windows Vista, although many seem to have been waiting for Windows 7, which does seem destined to be the OS that Vista should have been in the first place. Whether or not you upgrade ultimately depends on whether or not you fancy using the new Windows 7 features, which I've already discussed in this column. If your PC is essentially an audio workhorse, the only real difference you'll see is the option of the more attractive Aero graphics (which consume a tiny extra CPU overhead). You're unlikely to experience noticeably better performance than in Windows XP, but might get a slight performance improvement if you're currently running Vista. The primary reason that many musicians intend to upgrade to Windows 7 is not as much for its new features as for the option of switching to its 64‑bit version and being able to install and access more RAM. If you're currently running any Windows 32‑bit operating system, up to 4GB RAM is supported, although, as I explained in PC Notes August 2008, in practice you tend to get somewhere between 3GB and 3.5GB available for your own use, depending on what other hardware you have installed in your PC. Heavy users of sample libraries may find this a limitation on how many simultaneous voices they can achieve, but moving to a 64‑bit operating system lifts such restrictions. 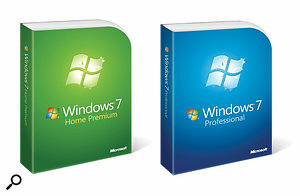 Moreover, if you do want 64‑bit support and have a suitable 64‑bit-capable sequencer and plug‑ins, Windows 7 is the only real choice, since although Windows XP Professional x64 Edition performed well, support for it has been largely dropped by audio developers. As usual, make sure you look before you leap, by checking that all your hardware devices have Windows 7 device drivers. In many cases, existing Vista drivers should work, but there are no guarantees, and once you've switched OS, the lack of a suitable driver will prevent you from using that hardware device until its manufacturers get around to developing one. As to which Windows 7 version is most appropriate for the musician, there are only two alternatives from the array of six that Microsoft have developed. The 64‑bit version of Home Premium supports an unlimited number of cores on a single physical processor, and up to 16GB of RAM, which should be fine for the majority of musicians. However, if you want a system with two or more physical processors and capable of using up to a massive 192GB of RAM (assuming you can find a motherboard that can fit that much! ), the more expensive 64‑bit Professional version is the one to go for, and it also gives you some extra features, such as an Encrypting File System (EFS) and 'Backup to network' support. Gigabyte UD5 Squeal: Various professional DAW builders and DIY PC builders alike have been suffering from an annoying problem with certain Gigabyte motherboards, in particular their GA EX58 UD5P model, so here's the lowdown. When audio software is being run, you hear low‑level but nevertheless unpleasant whining/squealing noises not dissimilar to those that result from digital ground‑loop issues. Sometimes the noises can be heard acoustically from vibrating PSU components, but for most musicians the problem is audible as background noises in the output of their audio interface (particularly so with Firewire models). There's even a YouTube video illustrating the problem (www.youtube.com/watch?v=XUk7NJDT9vM). If you hear such noises from your Firewire audio interface, unplug other audio gear from it and listen to the headphone output in isolation. If the noises have gone, you're suffering from a ground loop, and can resort to the usual cures, such as balanced cabling or a line‑level DI box. If the noises remain, you might be another victim of the dreaded 'UD5 squeal'. If so, the cure seems to be to disable the 'C1E CPU Enhanced Halt state' in the Advanced CPU Features section of the BIOS, which should also cure any PSU noises. This parameter is normally used to reduce power consumption but, due to an unfortunate design flaw, can produce a noisy side‑effect with this motherboard model. Microsoft WinDiff: Back in PC Notes February 2009, I recommended the donationware Easy Duplicate Finder (www.easyduplicatefinder.com) to help you track down and remove unwanted files that clog up your hard drives. Well, thanks to SOS reader Nicolas Algupeba, I can now also add that Microsoft provide a similar utility called WinDiff with all versions of Windows from 2000 onwards. It doesn't get installed by default, but you can install it by running the Setup.exe from the Support/Tools folder on your Windows CD‑ROM. Further details can be found on the Microsoft web site at http://support.microsoft.com/kb/159214.